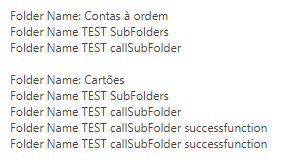 Why the Folder Name TEST callSubFolder successfunction is only executed in the end? What can I do to achieve the goal? Set async: false for your callSubFolder function. Don't use Async false!.... that is a really bad bad idea and not a good practice at all).